It is a pleasure for me to be here on the occasion of this inaugural ceremony. I congratulate the International Congress of Oral Implantologists for their initiative in hosting the 2nd South East Asia Implant Symposium on "Implant Esthetics. I am indeed happy to see that the participants in the symposium include delegates from our immediate neighbourhood - who will directly benefit from our country's progress in this field. I also appreciate the presence of participants from across the oceans - from nations that are our close partners and collaborators - including Korea, Taiwan, West Indies, the Gulf, Iran and the U.K. Distinguished Ladies and Gentlemen, it is a good development that oral health care, as a science, has grown in popularity and there is, today, a greater awareness of dentistry as a profession in our country. I am particularly pleased at the awareness that this conference will generate - at a time when there is still a deficiency of oral health care facilities in many cities and towns of India. The presence, at this Conference of Dentists and other professionals from as far as Kerala and Karnataka and smaller towns in Uttar Pradesh and Gujarat is a good sign - indicating that not only urban populations but societies located deeper in the heartland of India are working together to bring their people better access to dental health facilities. In this context, dental implants are a specialized category - an option available, till today, to only a privileged few - those able to afford it. While the Indus Valley civilisation used bow drills 7000 years ago and Egyptians practiced oral surgery from as early as 2500 BC, the Mayan civilization is said to have used the earliest known examples of implants embedded into bone dating back to about 600 A.D. They were found to have used tooth shaped shells. From the time that the first modern implant was placed in 1952, modern medicine has developed rapidly and now titanium is used to build 'posts' that function as 'roots' for implants. Today dental implants are said to have a success rate of about 75%. Techniques and technologies are continuously being improved and refined every day. The conceptualization of economically viable dental implants that are available, affordable and accessible to all sections of society is a noteworthy milestone indeed. The Indian Dental Association, in working towards this, is making an important contribution to our society. I understand that dental implants today constitute the single largest growing dental specialty. It is recognized as an important and popular subject of specialization and there is every justification for the science of implantology to be incorporated into dental education and given due priority in the curriculum of dental institutions throughout our country. I am told that the Army Dental Corps, together with the DRDO are presently developing indigenous technology that can make implants all the more efficacious and readily available to our armed forces and civilian population. I also gather that dental tourism as a concept has caught the imagination of foreign visitors who would like to take advantage of the high quality of implant services and related treatments that are more affordable in India. I am glad to learn that the Dental Council of India proposes to take up the study of the epidemiology of oral diseases including dental caries, periodontal diseases and oral cancer. I certainly subscribe to the view that preventive measures are as important as clinical intervention. Although oral health should always be an inseparable companion of general health care, modern dentistry has evolved slowly in India. It would therefore, be an invaluable service if the medical and dental community were to organize community health programmes - based on their evaluation of the changing priorities of the community and taking into account the technology and solutions available. A continuous assessment of ethical, socio-economical and legal implications should be taken up as a matter of course by our institutions and they must be accountable for the healthcare solutions adopted by them. Every new methodology which successfully passes the mandatory trials and testing is, eventually and in each case, another success story, a welcome step forward by our scientific community. I am sure that this symposium will have far reaching outcomes and also succeed in promoting co-operation among the participating students and professionals in the field of dental implantation. I offer my felicitations to the Dental Council of India and their associates and all the participants in today's conference and wish them every success in their individual and collective efforts and future initiatives. Website designed by National Informatics Centre. 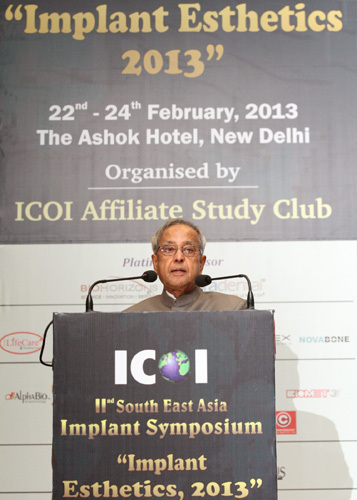 Website Content provided by the Office of Shri Pranab Mukherjee, Former President of India.